Often, Proportion-Air’s standalone electronic pressure regulators do not flow enough for a customer’s process. In this situation, we pair our QB2X (most common) with a Proportion-Air volume air booster for increased flow capacity. The Proportion-Air QB2 Volume Air Booster is not a specific product. It is a concept and a technology that we use to increase the versatility of our product line and meet the needs of the customer. Below are some examples of our electronic regulators being used as pilots to a variety of dome-loaded (volume air booster) pressure regulators. This is a tried and tested technology that we recommend to many customers. However, there are many nuances involved and we would love to help specify the combination that works best for your application. Please use the ‘Request Quote’ form below to tell us more about the process you would like to control. 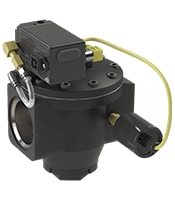 1 – QB2X Electronic Pressure Regulator provides an air pilot signal to the dome of the volume air booster. By controlling pressure to the top of the diaphragm, we control pressure out of the volume booster. 2 – A Volume Air Booster, also known as a dome-loaded or pilot-operated pressure regulator. This can be a pressure reducing valve or a back pressure valve. We have many volume boosters available that can handle different pressures, medias and flow rates. Understanding the application is critical to specifying the best fit. 3 – A DSB or DST Pressure Transducer measures output pressure of the volume booster and provides this feedback signal to the QB2. The QB2 adjusts dome pressure (based on this feedback) to achieve the commanded pressure in the process. Mark the Engineer has an application that requires tight pressure control from 0 to 90 PSI at an accuracy of ±0.2%. He will be controlling this pressure range in a static volume of 2500 cubic inches. Our QB1X model can control this pressure range at his desired accuracy, but with a max flow of 1.2 SCFM (ideal conditions), it would take the QB1X more than 5 minutes to pressurize Mark’s volume to 90 PSI. Problem #1: Mark needs to pressurize this volume to 90 PSI in under 2 seconds! This is where we implement a Proportion-Air volume air booster to increase the amount of flow into the process. By using our QBX to control the pressure on the dome side of the diaphragm in an air volume booster, we are able to control the process pressure through the volume booster as the forces on either side of the diaphragm naturally equal out. In other words, 90 psi on top of the diaphragm will naturally provide 90 PSI on the bottom of the diaphragm, providing pressure control with higher flow. An volume air booster is a mechanical pressure regulator that we control electronically. But if we are controlling pressure on the dome, we cannot measure the pressure in the process. This means the pressure accuracy in the process is affected by the mechanical hysteresis and inaccuracies of our volume booster. We call this single-loop control and (depending on the volume air booster) accuracy can range from 1% to >5%. Sometimes this accuracy is okay and can even be preferred in some applications. But for Mark, this is a problem. After we size and select the optimal volume air booster for Mark’s application, we add a 2nd loop so we can achieve the accuracy that Mark needs. In this case, our 2nd loop is a Proportion-Air DSB pressure transducer that we install on the output of the volume air booster. This transducer measures process pressure and constantly provides direct feedback to the QBX (now a QB2X). Our electronic controller now puts whatever pressure is required on the dome of the volume air booster to achieve the commanded pressure in the process. The accuracy (±0.2%) of the DSB transducer now drives the accuracy of the dual-loop volume air booster assembly. Control pressure as low as 0-2 Inches of Water Column with this High Resolution & High Flow, 1″ NPT pressure control assembly. Control pressures from 0 to 175 PSI and achieve flow rates up to 2,000 SCFM while maintaining an accuracy of ±0.2% of full scale calibration. Control pressure up to 6,000 PSI with this 45:1 ratio regulator assembly, while achieving accuracy of ±0.5% full scale calibration. Control vacuum and achieve flow rates up to 100 SCFM with an accuracy of ±0.2% full scale with this high flow vacuum control assembly. Control hazardous medias like methane and natural gas at pressures from 0 to 175 PSI with this FM Approved ISQB and unpainted volume air booster.